for April 9th are Joyful. the more one they are as members of Christ’s body, the Church, and grace is outpoured in that oneness to the entire Church and the world. This grace was merited by Christ’s life, death and resurrection and is released and distributed to souls all over the world. the more he is not the instrument of God’s grace he could be by living in unity, oneness with others. it is to have a Christic image and unite with Christ the head as one, holy, Catholic and Apostolic. Hearts of pure and perfect love. And grace flows when we pray united before the Blessed Sacrament, and at Mass. It flows copiously. as we live virtuously in Him. Abundant grace flows in this unity - united to the Trinity in perfect love. Serving God with our whole heart, our whole soul and our whole being. Oneness in the Hearts of Jesus and Mary. Jesus: I give you the Holy Sacrifice of the Mass, the sacrifice of Calvary sacramentally made present. 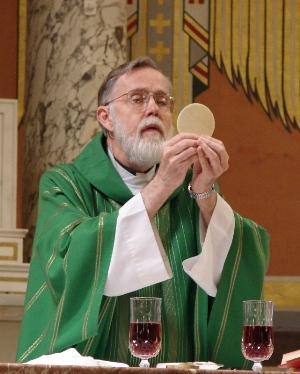 The Word and the Holy Eucharist. Love and unity at Mass. You pray at Mass to have your sins forgiven and to be pure. To unite in purity and love. I outpour My richest graces through the hands of My priests. Oh how I love you!!! You are My precious beloved. Mary's eyes were turned looking at Rita. Your heavenly Father has allowed me to appear on this building, and allowed me to be here with you this night. I am calling for this prayer on the 5th, wherever you are, to pray for the intentions of my Immaculate Heart and the Sacred Heart of Jesus, to pray for your priests, and the Church and the world as Jesus has instructed you, in the different languages and the mailing at Easter. I have given and given and given to you the signs that your heavenly Father has allowed me to give. Why your lack of faith? Do not hold on to the impurities, as the evil one wants to work in blocking my message of 25 years. I have appeared for 25 years, here - 25 years, since July 5th of 1994. There will be no people returning from hell, to tell you of its reality. Your heavenly Father has allowed me to appear to reach the children. It is a great gift that God has given, in my love for you. I stood beneath the cross of my Son and my heart was in such anguish for the little ones that would be lost forever. Have you heard that message? Have you listened? I stood beneath the cross of my Son and my heart was in such anguish for the little ones that would be lost forever. I cry to you my children, this day, to spread the Rosaries from the Hearts of Jesus and Mary and the messages of love that my Son has given leading people to the Eucharist, to the rosary, the children in the schools, the elderly that they offer up their days in the Morning Offering. It does not please your heavenly Father, that these ministries are being blocked, by those holding on to their willful and selfish ways. Pray for grace to be holy. Allow my Spouse, the Holy Spirit to transform you, in my heart, more and more, into the image and likeness of my Son, Jesus, and He will take you to the bosom of your heavenly Father. Your Father created you uniquely to be a gift to the world. You are precious, created by God. This is where your self-esteem can grow when you believe the truth. I am your heavenly Mother, Our Lady of Clearwater. Hear my message. 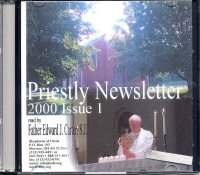 Spread the prayers that the Good Shepherd is giving to you, praying for the priests, the Church and the world and do not block this mailing going to the Spanish. I warn you. Those prayers are so important. For the priests, the Church and the world need this prayer given by the Sacred Heart of Jesus to Fr. Carter. Only satan would be at the head of the class to oppose this. You do not remain the same in the spiritual life, my children. Either you can seek to grow and live according to the commandments and the Word of God, and sacrifice growing in love, because God is love and you cannot be close to God unless you grow in love. Or you can give into the ways of the evil one and grow in that image and likeness, of darkness, of misery, and in hell there will be the weeping and the gnashing of teeth. This is reality. I speak as your heavenly Mother. God loves you, as you heard here this night. Reach with hearts of love. Listen to my warning. There are many souls that will be lost, souls that Jesus gave His life for. Help me. Your heavenly Father has allowed me to appear here, to speak here, to call these 5ths now for 24 years in public. 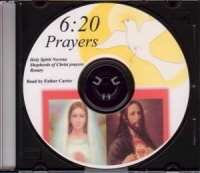 At 6:20 these prayers are to start with the Holy Spirit Novena, the Shepherds of Christ Prayers, the messages and the rosary. This is a gift to hear the voice of the Good Shepherd, that speaks here, and the voice and message of your heavenly Father that I deliver to you today. I am Our Lady of Clearwater, Our Lady of Fatima in the Americas. I am Mary, Mother of God. R. Now we say to this. Sing: Amen.